Let me begin by warmly welcoming all of you to the Chinese Embassy. I have been looking forward to this evening as my first official dinner at the Embassy. In fact this event was put on my diary even before my arrival in London. First of all, I want to express my hearty thanks to you and through you to all members of the All Party Parliamentary China Group for your efforts in promoting China-UK relations over the years. Your commitment to inter-parliamentary exchanges has contributed to mutual understanding and trust between our two countries. I want to thank Mr. Chapman, in particular, for his dedicated leadership of the Group for almost a decade. 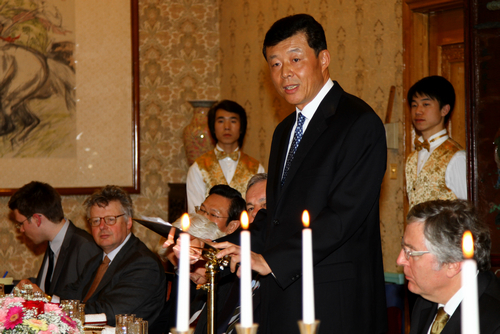 It was under his chairmanship that the All Party Parliamentary China Group became the second biggest group in parliament, with over 500 members from both chambers. Since my arrival, I have met with members of both the British government and opposition. Almost everybody was saying: "China and the UK should understand each other more". And the strongest message from the Parliamentary debate on UK's China policy last January was "We should endeavor to understand each other". So how can we do this? A good place to start is to learn about each other's language and culture. Last Saturday, I attended the "Chinese Bridge" Chinese Proficiency Competition. I talked about the importance of learning languages and encouraged young people in Britain to learn Chinese, which is a better way to understand Chinese culture and promote mutual understanding. Greater understanding between countries will require more knowledge of social systems and road of development. In my 36 years of diplomatic career, I have learned and used English, yet this is the first time for me to be actually posted in Britain. I tried to understand how the British political system works after hundreds of years of evolution. It seems to me the British political system is underpinned by originality and gradual progress. Britain is the birthplace of modern Western multi-party parliamentary system and a professional civil service. It is very good at preserving tradition and its parliament is a good reflection of that. Even to this day, the British society is discussing parliamentary reform and reform of the electoral system. What about the Chinese system? The past three decades of reform and opening up has seen fast economic growth and higher living standards across the country. China's political system and rule of law have also been improved. The National People's Congress enacted over 400 laws in the past 30 years. China has successfully found a way to develop socialism with Chinese characteristics. China will press ahead with reform and opening up. Neither standstill nor reversal is an option. The past thirty years has also taught us that stability is the precondition for development and a guarantee for reform. We'll try to balance reform, stability and development. China should never go back to unrest; neither can it afford any more disorder. China and the UK share similar visions for development. Both are committed to developing a political and economic system best suited to our national conditions and both aspire to political and social stability. This serves as a good basis for us to strengthen mutual trust and mutual understanding. China regards the UK as an important partner. Our relationship has gone way beyond the bilateral scope and is taking on strategic and global significance. We have in place mechanisms of annual Prime Minister's visit, the Economic and Financial Dialogue and exchange of visits between the foreign ministers. Just yesterday Chinese State Councilor Dai Bingguo and British Foreign Secretary Miliband held the strategic dialogue upgraded from vice minister level. The two countries have developed fruitful cooperation in a wide range of areas from economy and trade, finance, to education, culture, science and technology and sustainable development. We have maintained close contact and consultation in global affairs. Thanks to the effort by Mr. Chapman, a regular exchange mechanism was set up between the APPCG and NPC Foreign Affairs Committee. Naturally China-UK relationship is not always plain sailing. At the end of last year some problems cropped up in our relations. Yet this should in no way obscure the larger picture of China-UK relations, where our shared interests far outweigh our differences. Your care and support are essential for a stable and better China-UK relationship. You are important players and facilitators in promoting mutual understanding and mutual trust between our two countries. I sincerely hope that you will carry on your good work to further strengthen our friendship and cooperation. My colleagues and I will do our utmost to support you.